Save the Date announcements are the first chance you have to set the tone for your wedding. So, create a fun save the date. Here are some ideas for a twist on the common card—and unique ways to send a bit of your personality along with the postmark. Stick it to them– Mail save the date magnets that'll go on their fridge. 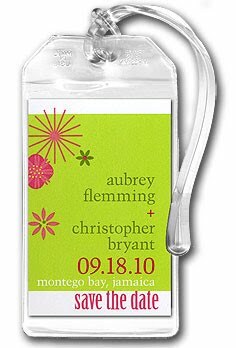 Or create a personalized label with your wedding details that your guests can put right into their date book. Photo Strip– A picture can say a thousand words-or maybe just the ten or so that you need everyone to know in advance of your wedding. Take a series of photos in a photo booth, holding paper signs announcing your engagement, the date, and the location. Make it stick by printing your photos on stylish photo magnet save-the-dates. Don't forget to kiss in the shot! 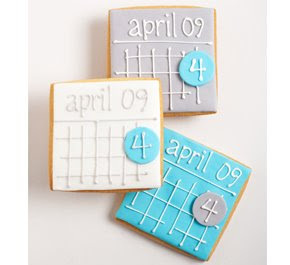 Eat dessert first – Personalized cookies can be a great way to save-the-date. Customize with your names and the date of your wedding. You'd just better hope that the cookie doesn't “disappear” before they've marked down the date! Love is in bloom – For a wedding next Spring, consider sending a personalized plantable seed card. By the time the flower bloom, it will be time to celebrate! It's in the cards – Send your invitees a deck of playing cards for your Vegas-themed wedding. Adding personalized poker chips with your names and wedding date makes for a fun personal touch. Tune them in – Send your save the date in the form of a CD. You might want to include a selection of songs that have personal meaning to you both or record the story of your engagement onto the CD. Be sure to include your names, along with the date and location of your nuptials on the cover. Mark my spot – Bookmarks with all the necessary save the date details can be made easily (and inexpensively) on a laser printer. After cutting them apart, punch a hole in the top of each one and attach a store-bought tassel. Mail them to your guests in a glassine envelope. No one will turn a page on this reminder! Souvenir Postcards – Postcards can be both a fun and cost-effective way to give your guests a sneak-peek at the wedding site. Visit a souvenir shop along the boardwalk, or consider springing for a selection of retro postcards from eBay. You also might want to consider creating your own postcard with a photo and a story about your engagement. (Everyone loves to see the photo that was taken moments after the proposal!) You may want to make the postcard round or square so it stands out from the usual junk mail. Favor the invitation – Consider sending a gift that represents the location of your wedding. If you are getting married on the beach in Mexico, you might want to mail a mini set of maracas, along with a personalized bottle of sunscreen (order labels for the bottles with your names, date and the location). Or, you might consider this personalized hot chocolate mix for your wedding in the Rocky Mountains. Personal Baggage – Personalized luggage tags are a great way to get your guests packing for your destination wedding! Thank you to Beau-Coup for the ideas!